The monastery is so named because it's located in Bhutia Busti (meaning Bhutia colony) which is some 1.5km (i.e. 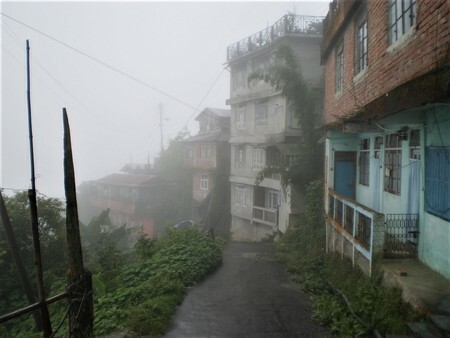 about a mile) downhill from the Chowrasta Mall of Darjeeling. This Monastery was earlier located in Observatory Hill where the Mahakal Temple stands today. It was originally built there in 1761 by the Lama Dorje Rinzing. However, since then the monastery had been through a series of misfortune. 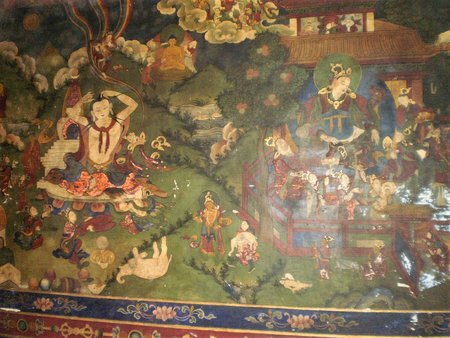 In 1815 during the Gorkha invasion, the monastery was plundered and completely ravaged. It was rebuilt in the year 1861. But due to many disturbances, it had to be shifted to a new location where the present Bhuitia Busti Monastery was built in the year 1879. As the luck may have it, an earthquake completely destroyed the monastery in 1934. 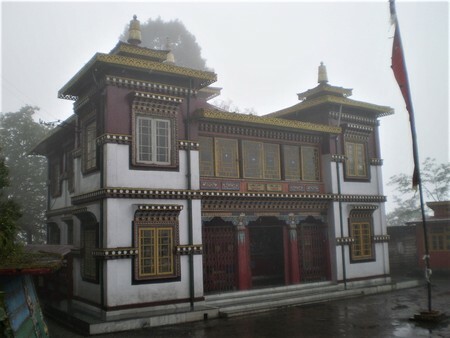 It was rebuilt with the patronage of the Late Chogyal (Dharmaraja) of Sikkim. So if you consider its origin since its first foundation at the Observatory Hill, this is the oldest Buddhist Monastery in Darjeeling having been through changes in its physical appearance and location. The present structure of the monastery is awesome. It has been built in a traditional Tibetan style with Sikkimese influence, and it's a great example of Darjeeling's vibrant Buddhism tradition. The monastery belongs to the Red Sect of Buddhists and has links with the Kagyu and Nyingma orders of Tibetan Buddhism. I had the privilege of spending a long personal time with the present Head Monk or the Lama of Bhutia Busti Monastery. It was a rainy and also a windy day. There was nobody around. Half drenched in rain, I was standing outside and wondering if the Monastery was open as I looked at the closed doors. Soon the doors opened and a monk came out. 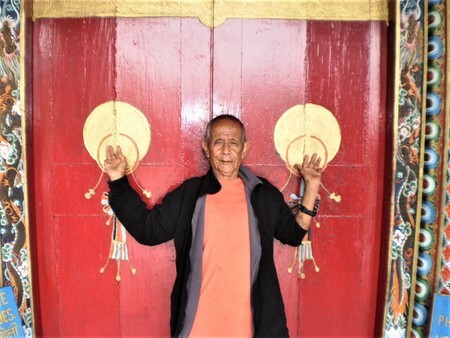 He introduced himself as the one in charge of the monastery, the Head Monk or Lama. His name is Aku. When I asked him how should I call him, he proudly said "AK, and that's enough. All know me by that name". With his pleasant and friendly personality, I was at home in minutes. He took me inside, narrated the story of his life and showed me the entire prayer room explaining every details. AK was born in Kolkata. At the age of 6 months, in June 1935 he was brought to the monastery in Darjeeling. Since then he has spent his life here and became a monk. He said "You know, I have been made a monk". He never learned any language and can't read or write even today. But he can speak many languages including Hindi and English. Monks have no possessions in life. He has one though, a beautiful dog. He goes to bed at 8pm and gets up at 2am in the morning everyday. The morning prayer starts at 4:30am. His has a sister and a brother living in Kolkata. 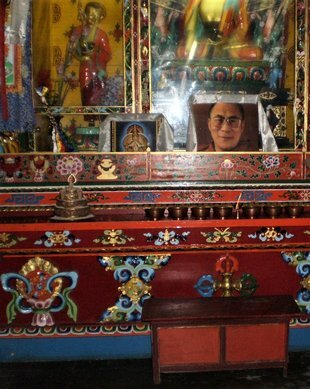 As you enter the Monastery's main prayer room, you will see a model of Buddha in a glass case and photographs of Dalai Lama. On one side of the room, there is an image of Tara Devi which is one of the new installations. There is also Lakshmiswari - a large image of a goddess that has thousand eyes and thousand hands. If you want, you can give donations which is used towards running of the monastery. Photography is strictly prohibited inside. Initially I didn't understand why. AK explained me the reason, I'll come to that later. He then looked at me for a while and thought about something, and then allowed me to take a few pictures as an exception. On the other side of the room, there are large wall murals depicting Buddha's life story. They look like wall paintings but AK clarified that they are not paintings. They are original artwork made with powdered stones. Different kinds of stones were converted into powder form by grinding them. Each reflected different shades of colors. Those were used in the awesome looking wall murals. And the bangles, ornaments and other decorative items on the mural are made using real gold powder. I realized now why photography is not allowed inside. AK took me to a side and asked me to look at the murals from a particular angle. Now some parts of the mural were shining and sparkling like gold, and I knew that there were precious treasures hidden over there. He also pointed towards the places where there have been attempts to scrape some materials out which now look badly damaged. Jut outside the prayer room and on one side of the front veranda, there is a large drum like hollow cylinder that you can rotate. It has prayers written on it. On the other side where a flight of stairs leads upstairs to the monk's residence, there is a large wall mural, but this one obviously has no gold. In between, the main door of the prayer room has two golden colored circles imprinted, one representing sun and the other one the moon. In AK's picture above, you will see the circles where he has placed his two hands. When it was finally time for me to leave, AK asked me to wait for a minute. He went inside and came back with a silver robe which he then passionately wrapped it around my neck and blessed me saying this will always protect you. It has been one of my prized possessions of lifetime. The Bhutia Busti Monastery is open daily from early morning until evening (7pm). The morning prayers start at 4:30pm till 6pm, and evening prayer is from 5pm to 6:30pm. The Bhutia Busti Monastery is located about 1.5 kilometers (i.e. about 1 mile) downhill from the Chowrasta Mall . You will need to take the CR Das Road from the Mall next to the CCD, pass the Step Aside and keep walking downhill. The locals might say that the walk is some 15-20 minutes, let me tell you it's about 30-35 minutes walk. In about 15 minutes, the narrow winding road becomes a lovely view road. You will pass by lush green landscapes with small village cottages on both side, and of course enjoying the great views of the mountains. The road is steep at places, so take your steps carefully. As you pass by a little pork meat shop, you know that you are few minutes away from the monastery. Soon you will see the large arch gate on your left. Now what about the return? One option is to take the same route back. That's going to be really strenuous unless you are used to steep uphill walk for over an hour. There is another option which I came to know from a local on my second visit. Continue on the same road downhill. There will be steep stairs at places that cut through the rocks offering shortcuts. After some 150-200 steps it again meets the same winding road below. If you have time and like to enjoy the walk at a leisure pace, keep to the road. The stairs are really steep. After about 15-20 minutes, you will see a milestone that says "Lebong 1km". Yes you will need to walk for another 20 minutes to reach the Lebong taxi stand. But after all you are walking downhill all the way. Once you reach the stand, you will find shared taxis (actually shared jeeps). It takes only Rs. 15/- per person to reach up to the Chowk Bazaar of Darjeeling which is 7km from here. Although they say that up to 10 persons are taken in a shared jeep, my estimate is lot more. You are likely to be stuffed in like chickens. We were five persons on the front seat plus a child. But it's fun. In about 20 minutes you will reach Chowk Bazaar. From there you can either take another taxi to the Gandhi Road/Nehru Road area, or walk uphill for 10 minutes or so. Check out Darjeeling Map to see the location of the Monastery. 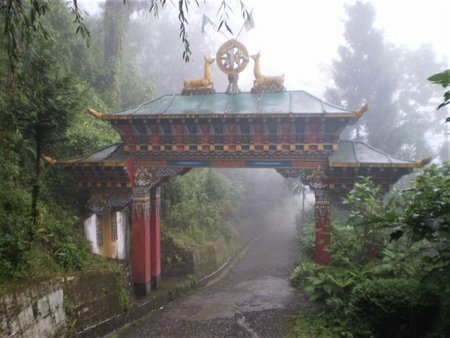 1) Check out Darjeeling Religious Shrines for all other great monasteries, temples and churches in Darjeeling.